Recently I changed my webhosts. On the positive side, both hosts use DirectAdmin based control panel, and have the same version of DirectAdmin software. But apparently, that was not enough. On my old hosting account, I had an installation of Mantis (a bug tracking software), which was installed through an automated installation system called Installatron. The new host doesn't support Installatron, they only support another software installation system called Softaculous. Softaculous has a page which talks about restoring the backup of an installation from a downloaded backup file. Unfortunately, these instructions do not work when the backup is made through Installatron installation system. But, irrespective of which installation system is used to install Mantis, the database structure of Mantis remains the same (if both installation systems install same version of Mantis). And since Mantis is completely database driven, it is possible to restore a Mantis installation by restoring the database. This is what I resorted to at the end. Using the DirectAdmin control panel of the old hosting account, I downloaded the database backup corresponding to the Mantis installation. 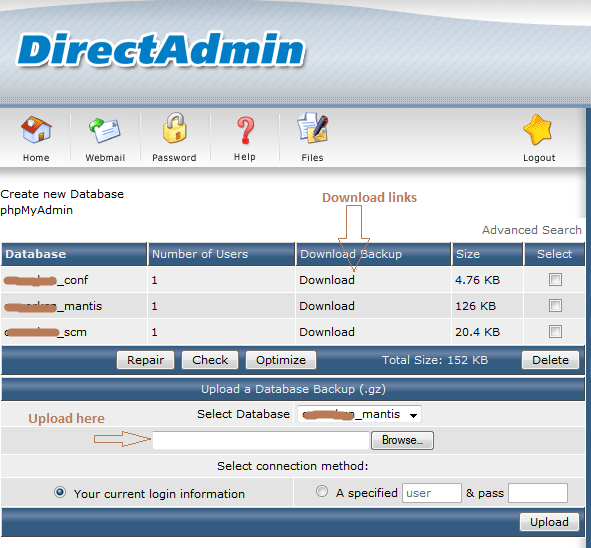 The database backup download link can be found at DirectAdmin control panel -> Your Account -> MySQL management. The screenshot below shows the links to backup the database downloads. After I saved the downloaded backup in my computer, I used the DirectAdmin control panel of the new hosting account to upload the backup to the database corresponding to the Mantis installation there. Note: You have to have a new installation of Mantis in the new hosting account in order for this to work. Once the database backup was uploaded and the data was restored, I got back all my data with the new hosting provider. Hope this helps someone.